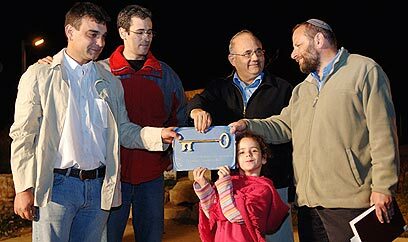 Revolution at secular kibbutz Shomria: Tears mingled with joy during a ceremony Sunday for Shomria residents to hand over the key to the kibbutz to evacuees from the Gush Katif settlement of Atzmona. For everyone, this marks a new beginning: For the evacuees, who finally get to start a new life in a permanent residence, and for the veteran kibbutz members, who are leaving their homes of 20 years to start anew. After long months of negotiations, Shomria’s 13 families transferred legal ownership of the kibbutz, in return for USD 300,000 per family, to the evacuees. With the money, the families will try to start a new life not far away, and in the meantime will live in temporary housing. In their place, some 50 families, who have been living in a tent city called “City of Faith” near Netivot since their evacuation from Gaza, will move into the kibbutz’s empty houses, cara-villas (luxury mobile homes) and caravans. 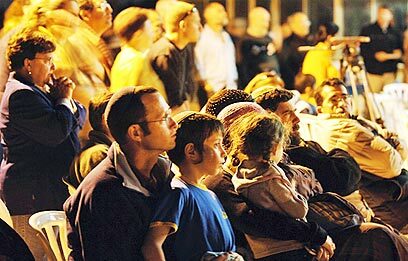 See all talkbacks "Kibbutz Shomria handed over to evacuees"